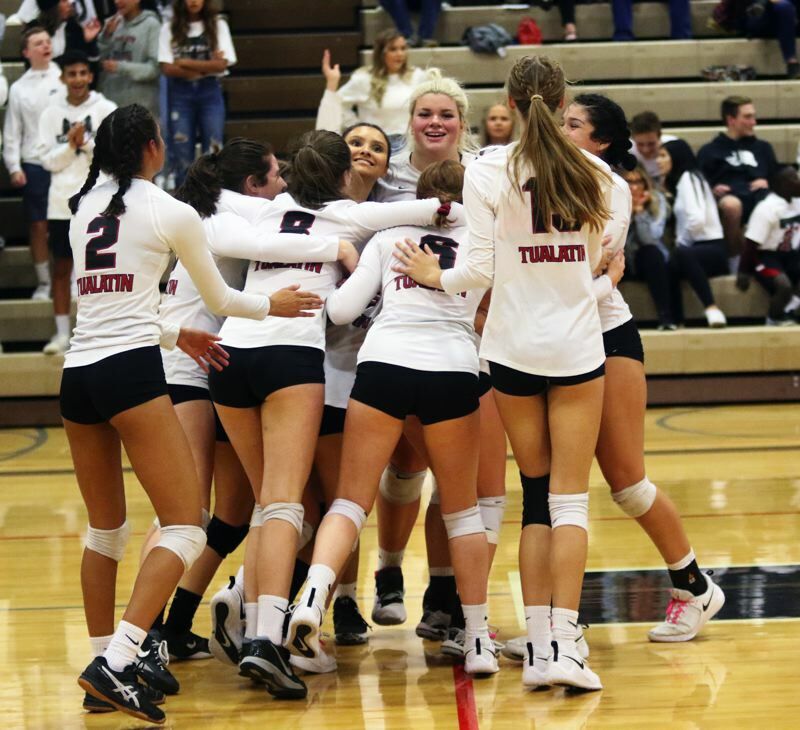 TUALATIN — As the volleyball state playoff first-round match got underway, the Tualatin High School squad was plagued by nervousness. But, when that match came to a close, the Timberwolves were filled with jubilation. 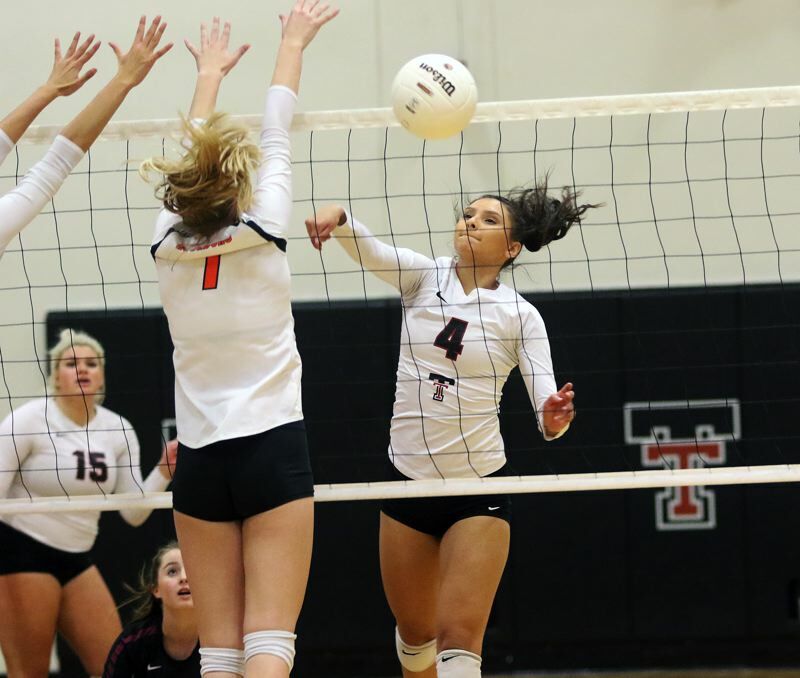 Tualatin, after struggling at the start, rebounded in a very big way, pulling things together to get a 16-25, 26-16, 25-12, 25-18 win over Roseburg in a Class 6A state playoff first-round match played Oct. 24 at Tualatin High School. "This is very big," Tualatin junior right side Olivia Ashley said after the victory. "We're so excited. We came in knowing it might be a very tough match, so we're happy we pulled through." "This is huge for us," Timberwolf junior libero Bella Valdes said. 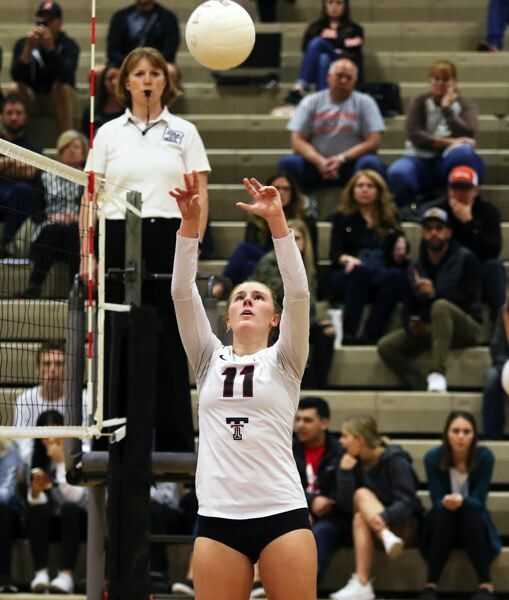 "Tualatin hasn't gone very far in the past, so we were hoping to go far this year." With the loss, Roseburg, the No. 2 team out of the Southwest Conference, finished the season with a final overall record of 12-11. Tualatin, the No. 3 team out of the Three Rivers League, improved to 15-7 with the win. The Wolves also advance to the second round of the Class 6A state playoffs for the first time since 2006. They'll face Central Catholic in a second-round match on Saturday, set to start at 1:30 p.m. at Central Catholic High School. "It's been a very long time," Tualatin coach Bridget Hinrichs said. "This was huge. They said since the beginning that they wanted to be in it, and get past the first round. That's always been their goal." But reaching that goal wasn't easy. Tualatin tied Roseburg at 10-10 in the first set following a kill by senior Tasha Loudd, coming off an assist by junior setter Jackie Phillips. But the Indians quickly regained the lead, at 11-10 on a kill by senior Morgan Johnson, and Roseburg didn't trail the rest of the set. In fact, Roseburg pulled away to win the set 25-16. "Everyone was super nervous," Ashley said. "We all wanted to play our best, and I think it got in our heads a little bit." "Sometimes we tend to start a little big slow," Valdes said. "Just knowing this could have been our last game was a big factor for us, especially for the seniors, who didn't want this to be their last game." With that in mind, the Wolves shook off the jitters and turned things around, in a big way, in the second set. Roseburg sprinted out to a 7-3 lead in the second set, but Tualatin fought back to tie the set at 11-11 on a sideout back-row kill by senior Kendra Zuckerman. The Wolves, with Ashley serving, then took a 12-11 lead on a tip by Phillips, and the home team took off from there. Back-to-back kills by senior Addison Crawford and Loudd gave Tualatin a 14-11 lead. 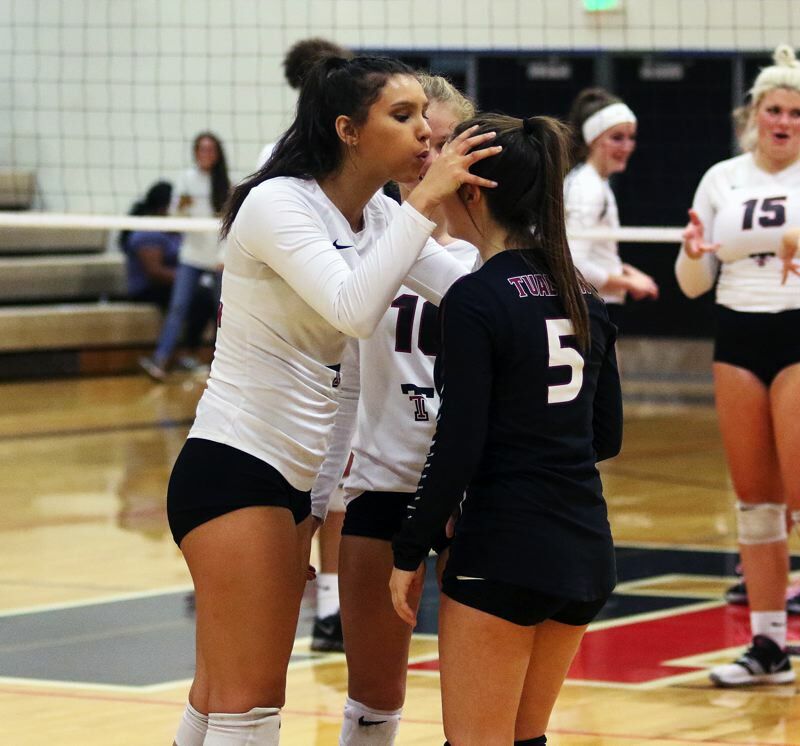 From there, consecutive kills by Loudd, a block and a kill by Zuckerman, a block by Ashley and, finally, a kill by Ashley off a set by Phillips helped the Wolves close out a 25-16 second-set win. "We really got together after that first set and we came together as a team, and that really helped us," Ashley said. Tualatin carried its momentum to the third set. In that set, they took a 3-2 lead on a kill by Zuckerman, and they kept that lead the rest of the way. 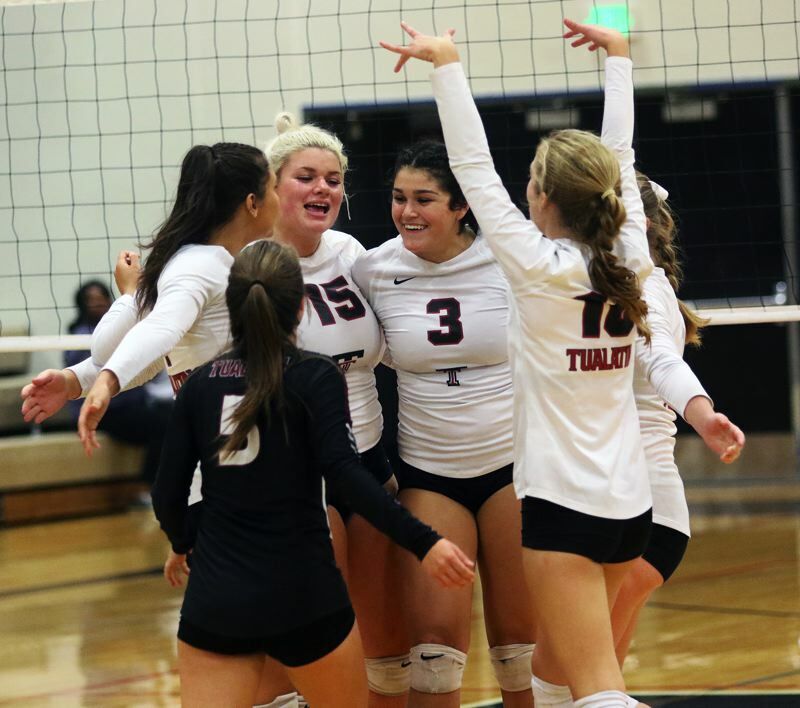 Back-to-back tips by Ashley, kills by Crawford and Zuckerman and ace serves by freshman Sophie Biehler and Ashley helped Tualatin push its advantage to 13-6. Behind the serving of Phillips, who had consecutive aces, the Wolves upped their lead to 21-9 on their way to winning the third set 25-12. But Roseburg, determined to push the match to a decisive fifth set, jumped out to a quick 3-0 lead to start the fourth set. "I didn't want a fifth set," Hinrichs said. "I wanted it to be done." Roseburg went on to take an 11-8 lead, but that's when the Wolves took over. Following a sideout kill by Crawford, with Valdes serving and Crawford having three more kills, Tualatin rallied to take a 14-11 lead. Roseburg tried to battle back, but the Wolves responded. 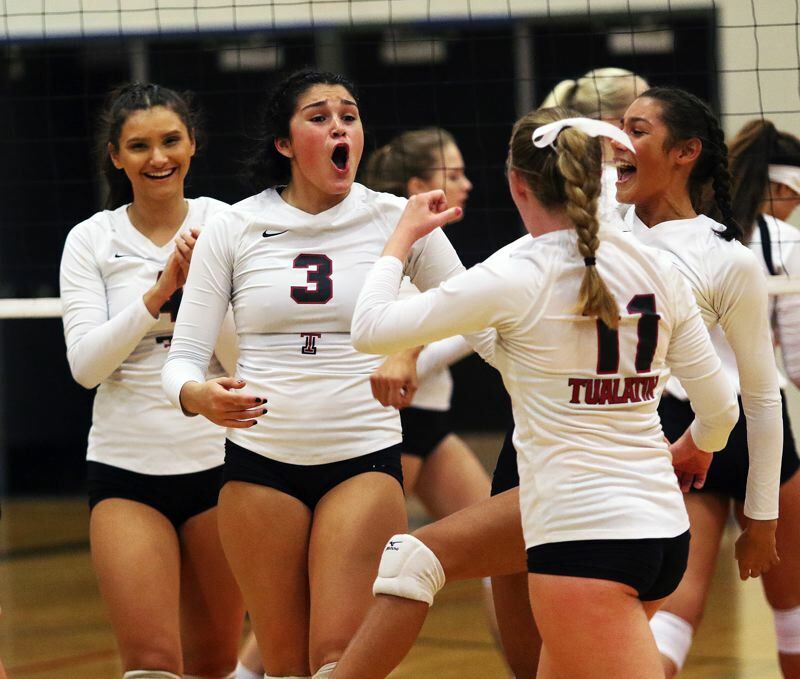 Holding a 19-18 lead, Tualatin scored the final six points of the set to get a 25-18 win, wrapping up the playoff victory. "This was super fun," Valdes said. "Communication is the big thing for us. Then we're just playing as team. It's so fun when everything is flowing, we're out there talking and having a lot of fun." "I was so excited," Ashley said. "We had so many great kills, and I was happy for everyone. Jackie was doing amazing." 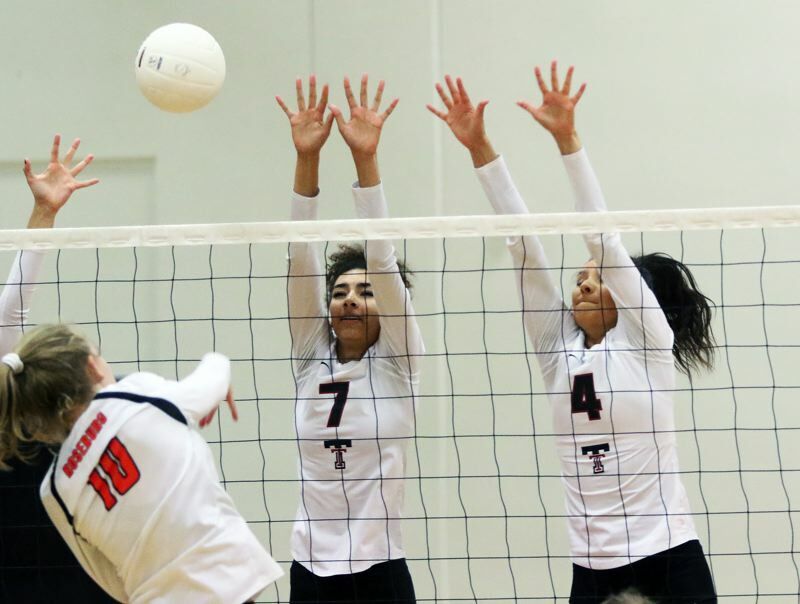 "The girls were so tense, they couldn't relax," Hinrichs said of the start of the match. "They were each were individuals, they weren't playing as a unit. But, in that second set, they turned it around. I just reminded them that this was one of our goals, and these guys came to play. They weren't just going to lie down because we wanted to win. We had to prove that we deserved to win, and they did it." Central Catholic, the Mt. Hood Conference champion and the No. 3 team in the final OSAA power rankings (Tualatin is No. 14) brings an overall record of 25-3 into Saturday's second-round state playoff match. "We need to really get it together," Ashley said of the second-round match. "Practice hard, get our strategy together and, hopefully, we can pull it through." "We're going to keep fighting, keep going," Valdes said. 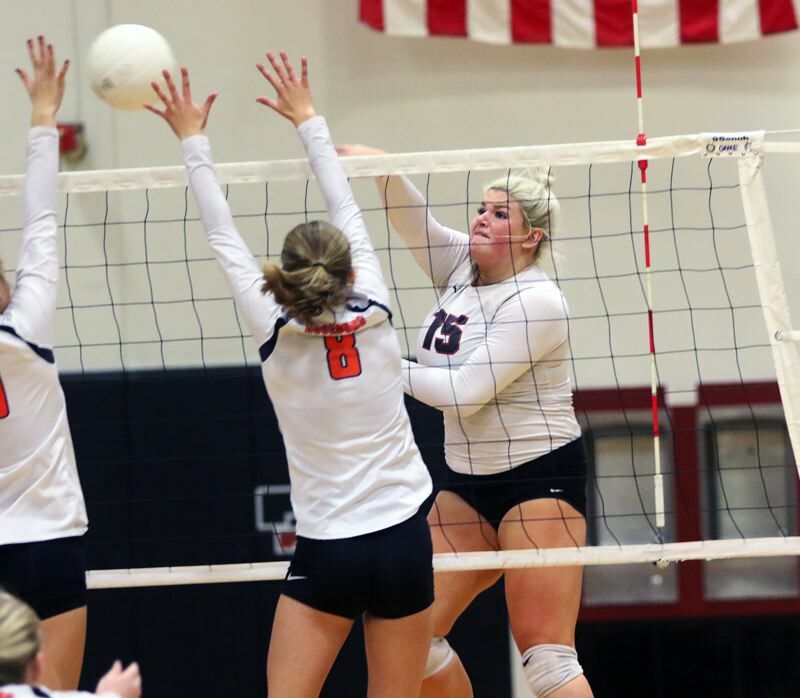 The winner of Saturday's match at Central Catholic will advance to the Class 6A state tournament, where it will face either Bend or Sprague in a tourney quarterfinal match starting at 3:15 p.m. at Liberty High School.